jazzoLOG: The Poor In The US Are Sick And Dying: Happy? Getting rid of things and clinging to emptiness is an illness of the same kind. It is just like throwing oneself into a fire to avoid being drowned. The greatnesse of our Lord confesse. The Gini coefficient measures the distribution of income on a scale from zero (where income is perfectly equally distributed among all members of a society) to one (where all the income goes to a single person). Yesterday at noon I attended a support meeting that I like to go to when school isn't in session. It lasts an hour, is attended by a few regulars, and consists of sitting in silence---unless someone wants to share how the day is going. When that happens we're not supposed to comment back particularly, or offer judgment. It's just practice in offering up something about oneself honestly and simply. On this day, however, (and this happens sometimes) a young, strong-looking woman no one had seen before jumped in immediately. She had been clinging to the man she identified as her partner, rubbing him and caressing him. He was silent but obviously concerned she was coming apart. Her voice and the rest of her trembled uncontrollably as she told why she was there. She said they were not from here, but had traveled the hour and a half down from Columbus, to move in with her grandmother. They had lost their jobs and home, and had a newborn. Grandmother had taken one look at her, called Social Services, taken custody of the baby, and thrown them both out by court order. The girl had been off crack for 3 days, but---and here she began to cry---she knew no other way to deal with a hopeless situation except to drug, she'd relapsed before, and now she was here in this room, with us. Any reader who has worked or volunteered in a religious institution or social agency of any kind, I'm sure, has had a situation like this land in your lap. Maybe you've been stung before when you offered food or cash. If you've referred the person somewhere else, you probably never did learn how it turned out. Maybe you're in a group, like the one I go to, where you actually get to see the person again and again, and possibly watch the miracle of a recovery occur---or not. Please forgive me if I insulted any reader with the title, which indicates more and more poor people in the United States are becoming sick, that this is one way of taking care of the "surplus population," and maybe that's OK with you. Maybe you don't know what else to do. Maybe you don't want to hear about it. Or think about it. Then surf on, reader, and be well---because a new article on the subject is out, and we need to go into it. When Majid Ezzati thinks about declining life expectancy, he says, “I think of an epidemic like HIV, or I think of the collapse of a social system, like in the former Soviet Union.” But such a decline is happening right now in some parts of the United States. Between 1983 and 1999, men’s life expectancy decreased in more than 50 U.S. counties, according to a recent study by Ezzati, associate professor of international health at the Harvard School of Public Health (HSPH), and colleagues. For women, the news was even worse: life expectancy decreased in more than 900 counties—more than a quarter of the total. This means 4 percent of American men and 19 percent of American women can expect their lives to be shorter than or, at best, the same length as those of people in their home counties two decades ago. The United States no longer boasts anywhere near the world’s longest life expectancy. It doesn’t even make the top 40. In this and many other ways, the richest nation on earth is not the healthiest. Ezzati’s finding is unsettling on its face, but scholars find further cause for concern in the pattern of health disparities. Poor health is not distributed evenly across the population, but concentrated among the disadvantaged. Disparities in health tend to fall along income lines everywhere: the poor generally get sicker and die sooner than the rich. But in the United States, the gap between the rich and the poor is far wider than in most other developed democracies, and it is getting wider. That is true both before and after taxes: the United States also does less than most other rich democracies to redistribute income from the rich to the poor. Americans, on average, have a higher tolerance for income inequality than their European counterparts. American attitudes focus on equality of opportunity, while Europeans tend to see fairness in equal outcomes. Among Americans, differences of opinion about inequality can easily degenerate into partisan disputes over whether poor people deserve help and sympathy or should instead pull themselves up by their bootstraps. The study of inequality attempts to test inequality’s effects on society, and it is delivering findings that command both sides’ attention. Much is still unknown in this dynamic field, where Harvard is home to pioneers who first recognized income inequality as worthy of study and younger scholars at the forefront of its study today. The variety of disciplines featured in presentations of the University’s Multidisciplinary Program on Inequality and Social Policy—economics, sociology, political science, public policy, health, medicine, education, law, and business—highlights the field’s broad importance. Because of the subject’s complexity and the scarcity of consistent data that would allow comparison between countries and across wide timespans, research findings are often highly specific or framed in the language of interesting coincidences, rather than as definitive conclusions. Even when discernable patterns exist, there tend to be counter-examples; for instance, the United States, with high inequality, has low life expectancy compared to Denmark and Finland, with very low inequality—but in Spain and Italy, with inequality somewhere in between, life expectancy is even longer. 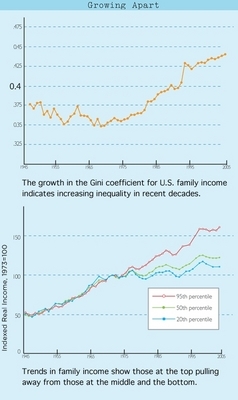 The United States is becoming even more unequal as income becomes more concentrated among the most affluent Americans. Income inequality has been rising since the late 1970s, and now rests at a level not seen since the Gilded Age—roughly 1870 to 1900, a period in U.S. history defined by the contrast between the excesses of the super-rich and the squalor of the poor. Early in the twentieth century, the share of total national income drawn by the top 1 percent of U.S. earners hovered around 18 percent. That share hit an all-time high in 1928—when top earners took home 21.1 percent of all income, including capital gains—then dropped steadily through the next three decades. Amid the post-World War II boom in higher education, and overall economic growth, the American middle class swelled and prospered, and the top 1 percent of earners took home less than 10 percent of all income through the 1960s and 1970s. Since then, the topmost 1 percent have seen their share rise again: it shot past 15 percent in 1996 and crested at 20.3 percent in 2006, the most recent year for which numbers are available. The argument that none of this matters as long as the overall economy is growing—that a rising tide lifts all boats, as President John F. Kennedy famously said—is the subject of vigorous academic review, with mixed results, but it may not be the most important question. Picture a buoyant luxury cruise ship surrounded by dilapidated dinghies, full of holes and on the verge of sinking. The fact that the tide has lifted them does not mean they are doing well. Investigating whether relative deprivation and the negative emotions it engenders help explain why the poor have worse health than the rich in most societies began with epidemiologist Michael Marmot’s study of British civil servants in the 1960s and 1970s. Marmot found that the lower-ranking bureaucrats had elevated levels of stress hormones compared to their high-status coworkers, even though the low-ranking workers still had job security, a living wage, decent hours, and benefits. Others have found similar links. Examining health outcomes for identical twins raised together—pairs that shared genes and environment—Nancy Krieger found that when the twins became adults, if one was working class and the other professional, the working-class twin’s health was, on average, worse. There is little question that it is bad for one’s health to be poor. Americans at the 95th income percentile or higher can expect to live nine years longer than those at the 10th percentile or lower. The poor are more likely to develop illnesses such as diabetes, hypertension, heart disease, and cancer, and there is evidence that relative deprivation and the stress it engenders are involved. When high inequality and rising top incomes shift society’s accepted standards of living upward, it seems that people experience deprivation even when they have adequate food, clothing, and shelter. The official U.S. poverty rate—12.3 percent in 2006—is relatively low, but scholars agree that number is essentially meaningless. The poverty threshold was developed in 1965 based on the cost of a grocery budget “for temporary or emergency use when funds are low,” multiplied by three. It was “arbitrary,” says Wiener professor of social policy Christopher Jencks, “but once it was adopted, it was politically impossible to change it.” That threshold has been adjusted for inflation, but does not take into account the fact that housing prices, energy prices, and certain other costs have grown faster than the consumer price index (CPI). “Going to movies, eating out at restaurants, going on occasional vacations, having Internet access and a cell phone—none of these things are in the federal poverty level,” says Ichiro Kawachi, professor of social epidemiology at HSPH and associate professor of medicine at Harvard Medical School (HMS). “What matters for functioning in society is what the average person is able to do.” During the same period, the Gallup Poll definition of the poverty line—based on asking people how much income they need not to feel deprived—has risen much more steeply than the CPI. As further evidence of a correlation between inequality and consumption culture, he points to national spending on advertising as a percentage of gross domestic product (GDP). The top-ranked countries on this measure, according to United Nations (UN) data, are Colombia, Brazil, and Venezuela—countries with inequality levels among the highest in the world—but also Australia, New Zealand, the United Kingdom (U.K.), and the United States, countries with higher inequality than similarly prosperous peers. The United States ranks twenty-first among the 30 nations in the Organization for Economic Cooperation and Development (OECD) in terms of life expectancy, and twenty-fifth in terms of infant mortality. Kawachi and others have found that the U.S. counties with the most income inequality stack up poorly on health measures, and as mortality rates have fallen nationwide, they have fallen most slowly in states where income inequality increased the most—a cause for concern, whatever the explanation. The recent increase in inequality reflects a migration of money upward as salaries have ballooned at the top. In 1965, the average salary for a CEO of a major U.S. company was 25 times the salary of the average worker. Today, the average CEO’s pay is more than 250 times the average worker’s. At the same time, the government is doing less to redistribute income than it has at times in the past. The current top marginal tax rate—35 percent—is not the lowest it’s been—there was no federal income tax at all until 1913—but it is far lower than the 91-percent tax levied on top earners from 1951 to 1963. Meanwhile, forces such as immigration and trade policy have put pressure on wages at the bottom. Tax policies and employer-pay practices affect income distribution directly. But what governs these pay practices, and why have American voters and politicians chosen the tax policies they have? One answer lies in Americans’ unique attitudes toward inequality. Asked by the International Social Survey Programme whether they agreed or disagreed with the statement that income differences in their home country are “too large,” 62 percent of Americans agreed; the median response for all 43 countries surveyed—some with a much lower degree of inequality—was 85 percent. Americans and Europeans also tend to disagree about the causes of poverty. In a different survey—the World Values Survey, including 40 countries—American respondents were much more likely than European respondents (71 percent versus 40 percent) to agree with the statement that the poor could escape poverty if they worked hard enough. Conversely, 54 percent of European respondents, but only 30 percent of American respondents, agreed with the statement that luck determines income. It makes intuitive sense that those who view poverty as a personal failing don’t feel compelled to redistribute money from the rich to the poor. Indeed, Ropes professor of political economy Alberto Alesina and Glimp professor of economics Edward L. Glaeser find a strong link between beliefs and tax policy: they find that a 10-percent increase in the share of the population that believes luck determines income is associated with a 3.5-percent increase in the share of GDP a given nation’s government spends on redistribution (see “Down and Out in Paris and Boston,” January-February 2005, page 14). These attitudes, in turn, are rooted in U.S. history, says Christopher Jencks, whose 1973 book Inequality examined social mobility in the United States. Jencks has been studying inequality and social class since the 1960s, and has written dozens of journal articles, essays, and book chapters, as well as four more books, on the subject. He looks back to the Constitution’s framers, who enshrined property rights as sacred and checked the government’s ability to control the national economy. “The founding fathers didn’t want the government to do that much,” he says. Former colonies such as Haiti and Namibia inhabit the top end of the Gini scale, with coefficients of .59 and .74, respectively. But there are exceptions to the pattern: the low end of the scale includes transitional economies that are far from rich (Belarus and Moldova, with coefficients of .30 and .33), and former colonies (Ethiopia and Laos, with coefficients of .30 and .35). For all the scholarly study, consensus on whether the Gini coefficient can, in and of itself, say something good or something bad about a country is still lacking. Still, scholars are using what evidence does exist to ask, and test, whether the United States has things in common with Sri Lanka, Mali, and Russia, as it undoubtedly does with Sweden, Switzerland, and the U.K. The excesses of the Gilded Age led, in the decades that followed, to a backlash in the form of the minimum wage and other labor laws to protect workers, business and financial-market regulation to protect consumers, social safety-net programs—Social Security, Medicare, Medicaid—and infrastructure investment to benefit all. But as the United States moves from a period of relatively balanced income distribution back into higher inequality, it remains to be seen whether these twentieth-century developments will enable the country to escape the problems that often accompany high inequality. An argument commonly made in inequality’s defense is that it serves to motivate. Here, Kawachi cites evidence from the sports world. A 1990 study of golfers found that they performed best in professional tournaments, where the spread in the size of the prize money is widest. Similarly, a study of professional auto racers found that performance improved as the spread in the size of the various prizes widened. This gets at the ways inequality may affect the fabric of society. Perhaps motivated by inequality and the prospect of getting ahead, Americans work longer hours than their European counterparts—about 200 more hours per year, on average, than the British, and 400 more hours per year than the Swedes. Again, there are counter-examples (the Japanese work almost as much as Americans do, just 50 hours less a year), but in any case, time spent at work is time not spent with friends or family, and this has its own implications for health. As an outreach worker in San Francisco in the 1970s, Lisa Berkman noticed that her clients in the North Beach and Chinatown neighborhoods—poor or working-class, but with the strong social connections typical of immigrant communities—had far better health than her clients in the gritty Tenderloin district, who were much more socially isolated and disconnected from one another. The link between social integration and mortality risk became the subject of Berkman’s dissertation at Berkeley, where she earned her Ph.D. in 1977. At the time, the idea that social ties could protect health was radical. Now it is accepted wisdom—and a factor that, Berkman believes, helps to explain the extraordinarily high life expectancy in Spain and Italy. As American neighborhoods have become more integrated along racial lines, they have become more segregated along income lines and, some research indicates, with regard to all manner of other factors, including political and religious beliefs. (The Big Sort, a new book by journalist Bill Bishop, examines this evidence.) What’s more, even along racial lines, American society is still far from integrated. Sociologist David R. Williams, Norman professor of public health and professor of African and African American studies, has examined racial discrimination and health in the United States and elsewhere, including South Africa, where in 1991, under apartheid, the “segregation index” was 90, meaning that 90 percent of blacks would have had to move to make the distribution even. “In the year 2000,” says Williams, “in most of America’s larger cities—New York City, Detroit, Chicago, Milwaukee—the segregation index was over 80.” Only slightly lower, that is, than under legally sanctioned apartheid. This doesn’t seem possible in a democracy such as the United States, where each citizen’s vote carries the same weight regardless of income (the electoral-college system notwithstanding). In fact, given the shape of the income distribution, it seems that Americans would elect leaders whose policies favor the poor and middle class. Mean household income in 2004 was $60,528, but median household income was only $43,389. More than half of households make less money than average, so, broadly speaking, more than half of voters should favor policies that redistribute income from the top down. Instead, though, nations—and individual states—with high inequality levels tend to favor policies that allow the affluent to hang onto their money. Filipe R. Campante, an assistant professor of public policy at HKS and a former student of Alesina’s, thinks he’s discovered why. After investigating what drives candidates’ platforms and policy decisions, Campante has concluded that donations are at least as influential a mode of political participation as votes are. Previous research has shown that voter turnout is low, particularly at the low end of the income spectrum, in societies with high inequality. Again, this is counterintuitive: in unequal places, poor people unhappy with government policies might be expected to turn out en masse to vote, but instead they stay home. Campaign contributions may provide the missing link. Candidates, naturally, target voters with money because they need funds for their campaigns. And since the poor gravitate toward parties that favor redistribution and the wealthy align themselves with parties that do not, campaign contributions end up benefiting primarily parties and candidates whose platforms do not include redistribution. By the time the election comes around, the only candidates left in the race are those who’ve shaped their platforms to maximize fundraising; poor voters, says Campante, have already been left out. In a study of campaign contributions in the 2000 U.S. presidential election, he found that higher income inequality at the county level was associated with fewer people contributing to campaigns, but contributing a larger amount on average—so the haves participated, and the have-nots did not. Improving living conditions in poor neighborhoods is another way to alleviate poverty’s ill effects even in the absence of income redistribution, says Williams. The poor are more likely to smoke, to eat poorly, and to lead sedentary lives. These are personal choices—but every choice is made in context, and one’s surroundings affect the choices one makes. “When people live in areas where there aren’t supermarkets that sell fresh fruits and vegetables, their intake of fresh fruits and vegetables is dramatically lower,” he says. “If people live in areas where there aren’t sidewalks, where there aren’t safe bike paths and places to walk and playgrounds, or where the rate of crime is so high that it’s not safe to go outside, then their level of exercise is much lower and their rates of obesity are higher.” Building parks and sidewalks and bringing farmers’ markets to poor neighborhoods, then, makes it easier for residents to make healthy choices. Another category of initiatives aims at improving living conditions for poor people by giving them vouchers to move to better neighborhoods, but the details are important, says Dolores Acevedo-Garcia, an HSPH associate professor of society, human development, and health. She is helping design the public-health component of one such program. Stemming from a landmark 2005 desegregation court case, it has already enabled about 1,300 former tenants of Baltimore public housing to move to suburban communities. “What people are expecting,” she says, “is that if people move to a new neighborhood, they’re automatically going to do better. Well, in fact, a lot of this is about connecting people to resources”: for example, helping them find landlords who will rent to them—not the easiest thing in an unfamiliar neighborhood. “Adults’ economic status is positively correlated with their parents’ economic status in every society for which we have data,” write Christopher Jencks and Laura Tach, a doctoral student in sociology and social policy, “but no democratic society is entirely comfortable with this fact.” The prospect of upward mobility forms the very bedrock of the American dream, but analyses indicate that intergenerational mobility is no higher in the United States than in other developed democracies. In fact, a recent Brookings Institution report cites findings that intergenerational mobility is actually significantly higher in Norway, Finland, and Denmark—low-inequality countries where birth should be destiny if inequality, as some argue, fuels mobility. In the United States, the correlation between parents’ income and children’s income is higher than chance: 42 percent of children born to parents in the bottom income quintile were still in the bottom quintile as adults, and 39 percent of children born to parents in the top quintile remained in the top quintile as adults, according to the Brookings analysis. But it is difficult to see whether mobility is increasing or decreasing, because it would require comparing specific individuals’ incomes to their parents’ incomes, against the wider backdrop of income distribution across society at that time. Because data with that level of detail do not exist for earlier periods, scholars can’t say with certainty whether the results represent an increase or a decrease in mobility from other periods in American history. Americans’ steadfast belief in mobility probably stems from increases in absolute, rather than relative, mobility. As the overall economy mushroomed throughout the nation’s history, the majority of people exceeded their parents’ income. Recall Katz’s apartment building analogy; rather than tenants moving from one floor to another, the entire building was shifting ever higher on a hill. But “if anything,” Alesina and Glaeser write, “the American poor seem to be much more ‘trapped’ than their European counterparts,” in the sense that fewer people who start life in the bottom quintile ever make it out. This is puzzling given American society’s emphasis on fairness and openness. Lee professor of economics Claudia Goldin and Katz detect an explanation in the increasing cost of college tuition. In 1950, the average tuition price at a private college was roughly 14 percent of the U.S. median family income; public college tuition was even lower (only 4 percent). Percentages for both types of institutions fell further in the ensuing decades, bottoming out around 1980, but then rising steeply ever since. In 2005, the cost of attending the average public college was 11 percent of median family income; for private colleges, the average was 45 percent. There is financial aid, but not enough, and the system “can be harder to crack than Fort Knox,” Katz and Goldin write in their new book, The Race between Education and Technology. For most of the twentieth century, the average American exceeded his parents’ education level by a significant margin: between 1900 and 1975, the average American’s educational attainment grew by 6.2 years, or about 10 months per decade. Then, between 1975 and 1990, the authors find that there was “almost no increase at all”; from 1990 to 2000, there was a gain of just six months. Although college graduation rates for women are still rising steadily, for men they have barely increased since the days of the Vietnam draft. At the same time, the “college wage premium” has also increased. In 1975, the average college graduate’s hourly wage was 24 percent higher than the average high-school graduate’s. By 2002, that number had risen to 43 percent. Katz and Goldin say this increase indicates higher demand for workers with college degrees, even as computers have eliminated the type of jobs a high-school-diploma recipient or mediocre college graduate would have done 25 years ago: clerical work, basic accounting, middle management. Technology has exerted downward pressure on those workers’ pay, explaining stagnating wages at the middle and bottom of the income distribution. The United States once led the world in the rate at which its citizens finished college; it now falls in the middle of the OECD pack. It could lead again if Americans made a decision to fund higher education the way they chose to fund universal public high-school education early in the last century. “If you had made people borrow money to go to high school in the early twentieth century,” says Katz, “you wouldn’t have seen the same sort of expansion.” But as technology continues to advance, if Americans do not break down barriers to higher education, the authors foresee an even more acute shortage of highly trained workers—and, other things being equal, a further increase in inequality. Elizabeth Gudrais ’01 is associate editor of this magazine. Copyright ©1996–2008, Harvard Magazine, Inc.
27 Jun 2008 @ 20:03 by quinty : The richest country in the world. Think of it, think of our wealth. How proud we are and how so many of us believe “they hate us for who we are.” That “they” being the third world’s poor. It is a common argument among the powerful: when the powerless resent the arrogance of power it is due to mere envy. We live by many myths in this country. And these myths hide the numerous contradictions which are our reality. For anyone who has been paying any attention knows we rank way down in the world’s health statistics. And that per capita we have one of the most expensive and ineffective health systems in the world. Only in America would we believe that profit deserves a natural precedence over healthcare. Only in American would insurance companies be allowed to make life and death decisions. Or that Big Pharma’s profits and corporate interests are more important than old people receiving their medicines. Wherever you go in this country you will see great contrasts between wealth and poverty. It is, in fact, often striking when you drive about. I’ve done this many times. You see pockets of great wealth and then huge pockets of poverty, sometimes right up against each other. The wealthy live pretty well, yes, they do. But next door the poverty on the streets often creates a deeply dismal gray climate, something which can rot out the soul. And some of these poor neighborhoods go on for miles, mile after mile of desolation. But chief among our myths is that you pretty much reap what you deserve. For the worthy can work their way out of poverty. That is the American Dream. Unfortunately, human nature doesn’t work that way. But in a heartless capitalist economy that iron rule applies to everyone, to the wounded too. Those lacking the power to raise themselves up. Nor do these iron laws of society recognize the validity of any other values. They are iron laws, after all. And everyone has to play by them. So if you are poor then you yourself are to blame. The fault is yours, even if that means you may not be able to obtain the necessary healthcare you require. And then there’s TV, constantly presenting an upper middleclass lifestyle to us. In the world of advertising even the poor live in beautiful houses with big neat green lawns. Eventually, heavy watchers may begin to view this as the norm. That America is a land without squalor or poverty out on the streets. They have this to contrast their own reality to. As Marx and Seneca pointed out, it’s much in the head. As for public education we should be falling over ourselves to improve it, and make it more available. Isn’t this a basic quality of life issue? And one which clearly affects us all? Rich and poor alike? For only hermits aren’t at all touched or influenced by their outside world. And as the author in "Harvard" points out widespread public health issues affect us all. Without immunization, for example, everyone could be infected by a communicative disease. Even those living behind stone walls. Nor does the Bush administration seem to believe the FDA has a place in our economy. Since they appear to think disabling “big government” is a greater good than preventing salmonella and food poisoning from becoming a national health problem. 5 Jul 2008 @ 23:33 by a-d : The "richest country"
6 Jul 2008 @ 15:39 by quinty : Brainwashed? It doesn't matter to me if the US is the "richest" or not or who is. And since the stat’s don’t sit before me I don’t know what they tell us, though I suppose a quick Google search would turn them up. Be my guest, if you wish, A-D? As for who "lives" the best that's a matter of taste. I recall once attending a computer workshop in San Francisco at which the instructor related how she once told the participants of another workshop that the US was more advanced in computer technology than Europe. And a European in that earlier audience replied, "Yes, but we know how to live." Our instructor was still miffed, saying: “Thanks a lot!” Whereas I exchanged glances with another participant sitting nearby since we both knew there was a great deal of truth in that European’s comment. There is much about European life which I find extremely attractive. The pace is slower and though “Americanization” has taken some root there you can still find many of the old customs and habits. And then there’s the food. Though on the news yesterday I heard the French may have to begin to pay exorbitant prices for snails since it is no longer profitable to raise them. That is truly very sad, since escargot - which you can find almost anywhere in Europe - is a simple and true culinary delight. Another hot and muggy day in what seemed to be an endless summer of scorchers. Mary Cole was fighting an intestinal flu, but found it impossible to take time off from her job at Wal-mart. She couldn’t “afford” to be sick. When her bowels told her that she had to “go,” she notified her boss, who blandly told her that it wasn’t her “break time.” She tried to explain, but he walked away. Within three minutes, she soiled herself and started crying. Frank, another clerk, hears what happens, and begins an angry exchange with Harold, the manager. Enraged at being yelled at, Harold fires Frank on the spot. A small group of employees surround the two in a tight huddle. Frank, instead of leaving, continues to argue, as other employees join in. It escalates with Harold being dragged into the employee lounge and assaulted. Someone calls the police, and four men, including Frank, are arrested. Mary is eventually fired for “instigating” the incident. It doesn’t take very long for a half dozen people to show up on the street where the repo man leans on the tow-truck. More people join them. Several of them have already faced the same tow-truck and bored looking repo. Shouts start, and bottles fly at the tow-truck, which speeds away in the August heat. The repo guy dodges a bat, and takes off with a fresh array of dents to the car he came in. “We are the decent, law-abiding citizens,” he began nervously, “that built America. We are the ‘Joe six-packs’ who have always played by the rules, paid our taxes, and our mortgages. But they lied to us. We can’t refinance, like they promised. We live in Ohio. We live in Kansas. We live in Michigan, and Indiana. The last few years have been hard, but we’ve known hard times before. We’ve been ground down, but what’s happening now is different. The plastic is maxed out, and the interest rate is insane. “We’ve given up our decent car. Now we drive a beater to work. We gave back the keys on our dream home. Now we live in a crappy apartment. Go out to eat? Hell, our wives have been reduced to hitting up the food pantry behind our backs. We’ve eaten too many “Velvetta” sandwiches for lunch, and our families have shared one too many cheese pizzas for dinner. We took a second, even third job, and our crummy pay check can’t provide enough gas money, steady meals, or a decent roof over our heads. Our kids are freezing at night in the winter, and still the oil bill is completely ridiculous. We’ve cut out all the extras, but the “math” doesn’t add up. Frank begins to tremble. His voice cracks. Tears well up in his tired eyes. “That’s quite enough!” the Judge cuts him off. Frank’s mouth is still slightly open. His lower lip trembles. Suddenly, Frank has an epiphany that feels like a ball of boiling oil in the pit of his stomach. Thoughts pop into his head. Strange thoughts. An eerie calm relaxes the muscles in his face, and spreads through his entire being. He doesn’t care what I have to say. He doesn’t even care what happened to Mary. He’s just one more big shot that could care less if we can pay our bills, keep a roof over our heads, or feed our kids. There is no justice. I’m on my own… We’re on our own…. Frank is not alone. Something inside the American working class “snaps.” Soon the feeling spreads like a treetop wildfire. No one knows why, or where it started, but thousands of people from working-class neighborhoods write, “I’m so broke I can’t even pay attention!” on there credit card bills, and mail them back, postage paid. Bloggers, labor organizers, and talking heads, all scramble to explain what’s happening to all the “Franks” across the country. What’s behind this wave of “Econo-Crime?” Some attack or defend, while others apologize, or demonize. But it doesn’t matter. Not to Frank. Frank has already taken a baseball bat to his TV and dropped it on the curb. When six families on his street get their electricity shut off, he visits the electric company, and smashes all the car windows in the executive parking spaces. The next morning, in silent solidarity, six more TV sets are in broken heaps, curbside, on his street. Frank played by the rules and expected to keep his dignity in tough times, to keep body and soul together. He was even willing to surrender the notions of prosperity and upward mobility that his parents had told him was his birthright. But how can he give up the expectation of having the basics? Food? Shelter? Gas money for work? The “Franks” become political, but only in the most radically personal way. There are no “leaders” in any traditional sense, even though some will try and run ahead to act as “spokesmen.” Politicians at first, will strive to “contain” them, but it will not matter. Demagogues will try to harness their rage, but will be ignored. They will not be contained by politicians, or co-opted by opportunists. It will all unravel, unexpectedly and sporadically. While “official” reactions will incoherently bounce between condemnation and conciliation, sympathy will burgeon on the sidelines. Like the Argentineans who took to the street chanting: “Everyone Must Go! No One Can Stay!” working-class Americans will come to feel in a very personal sense that the system has failed them, and they have nothing left to lose. We haven’t seen this kind of class rage in over a century. So far these Americans have been quietly complacent, waiting for the fundamental change that never comes. What will happen when Middle America can no longer muddle through? Maybe it’s time for a Frank conversation. Frank Lee is a community organizer, social critic, and writer. "On July 8th I was phoned by a group called ProMark Research purporting to do research on the upcoming election. After a number of questions about my views of state and federal candidates, the real purpose of this call became evident -- to slander a local candidate! "After some general questions on my views about Debbie Phillips and Jill Thompson, candidates for the Ohio Legislature, the interviewer read a series of statements portraying Ms. Phillips in a negative way -- stating various things that could be viewed as her poor behavior -- asking how I felt about her candidacy after each statement. No list of negative things was given about Ms. Thompson. Curiously, one of the so-called bad behaviors was an allegation that Debbie was arrested for civil disobedience in a protest of the first Gulf war. Since my husband was part of that demonstration and was arrested along with a number of outstanding local citizens, I thought it was to Debbie's credit! "I don't know who is funding this sleaze attack: Ms. Thompson's campaign, the local or state Republican party, or our very own "swift boat" group, but my opinion of Ms. Thompson has really dropped. "If you get a call from one of these groups, don't be fooled: the purpose is to blacken the name of a candidate, not to tell you why another candidate is better qualified, or to get honest information about public opinions. Don't fall for it. "This ProMark company says it's based in Houston, Texas, but I have no other information. I happen to be in my hometown in Western New York for the weekend, and so I'm a bit hard put to followup on my post from yesterday. Neverthless, I received a reply from attorney Susan Gwinn, our Democratic Party chairperson. She asked that I share with you her impression of what the people who employ Promark are up to with their pushpolls. She says most certainly this is the Republican Party trying to find out if what they consider to be "dirt" about Democrats resonates with the people who are telephoned. Then Repubs can construct radio, TV, and mail attack ads out of the Promark results. Since television is so expensive, it is most efficient to use this telemarket method first...and then shovel their money into the attack that will work best. Susan asks that you not hang up on them if you are called, try not to react but rather jot down all the questions they ask and statements they make. Email to me or post here what they say. I'll relay the information. This way Democratic candidates can prepare for the attacks. I understand Ann's message is appearing in our local newspapers as well. I don't know if Susan is replying in that medium, or if she thinks someone should do so and relay this information. However, I do believe she wants people to spread the word. what loathsome extremes these people go to.... And for what? of lentils in other words. If only those who don't want power had the power. But then power is taking power and pushing those who don't care about power aside. Simultaneously insulting them by blaming their lack of power on them. Reminding them this is how they have to behave to fill the vacuum. I suppose this could be seen as some sort of Newtonian process, and could be described as the First Law of Social Dynamics. Having always opposed deregulation I hope a majority of voters snap out of their faith in the benefits of unfettered free enterprise. In Massachusetts there will be a state proposition on the upcoming ballot eliminating the state income tax. This sounds unrelated but it’s not. If we had state referendums here in Rhode Island I’m sure it would pass. This is how I think it works. First there is an abuse, a scandal, an act of industry wide exploitation. Thousands are harmed by this abuse and government steps in to regulate the industry. The years pass, the decades fall away. But in the meantime industry spokesmen complain of “big government” interference and promise greater efficiency and competitiveness if only the “free market” would be allowed to have its way. Since the regulations work the abuses which prompted them originally are forgotten. And the widespread wave of enthusiasm for “free market” principals and solutions claim the day. Lower costs and greater productivity are promised. The voters buy it. But once the regulations fall away the former abuses can return. The lie that regulation wasn’t required because there were no abuses to regulate becomes revealed at the expense of the consumer. Revealed as he recoils from becoming victimized by a rapacious and unregulated industry. And in the meantime another exploitive bubble bursts. A small minority makes millions during the run while millions finance the game. And the American taxpayer, rich and poor, loses. No, I’ve seen what deregulation can do, and was a victim of Enron in California. In banking, the home mortgage industry, the airlines, energy, the news media and airwaves: others you can think of: all of it merely offering greater freedom for those who would exploit these industries at the expense of everyone else. While we pay for it. If ever there was a reason not to vote for McCain it is Phil Gramm. maybe they're awash with TV, love tooling about in their cars and believe in the American dream? All the myths and fables which define us. Though frankly, I think when it comes to stupidity nobody has a real edge over anyone else. Why did the Germans go in for Hitler? Why did the English Tories believe fascism would be a barrier against the red hordes? Look at Italian politics? What mayhem! And they elect Berlusconi? It could go and on. Misfits, thugs, monsters, idiots, murderers - how many of the world's leaders don't fit into some horrendous category? Is there one you would lend the keys of your car to and expect to see it again in the driveway in the morning? No, if the rest of the world were any brighter we, the US, would have been quarantined a long time ago. We just happen to have outdone ourselves recently with the "smirking chimp." McCain's head does seem mushy. Obama is our best choice, but he has crawled from the left toward the right the higher he has climbed. Yes, at one time he really did believe in all that stuff coming from the Reverend Wright. Or course he did. And now - last I heard - Wright has disowned him as a traitor to the cause. Many mysteries to ponder. At least that's how I see it. that the Americans have suffered from the collective Teen Ager's arrogance and feelings of being NOT all so self confident, which EVERY teen KNOWS mUST be KEP SECRET from the rest of the World!... How better do it than BRAGGING over OWN GREATNESS!???!?! ?...even no real greatness was there to bragg about!... "American Justice system being the BEST inthe WOoOORLD". "American Health Care being theee BEST in the WOOOORLD". American this, American that being theee most SUPERLATIVE!... Superlatives are ALWAYS a sign of insecurity in the person!... --you're right; regardless "who" that person is! But there is /has been the last fifty years alot of superlatives of & about America by Americans. who when truth come into day light don't have a faintest clue about the most basic school knowledge: too many here do not have a clue about geography, for instance beyond their own route to Work!.... let alone any geogr. of the rest of the World! And with this kind of ignorance; how can we expect people to know of any "more important Questions"???...!!! we can't! How to fix this deep rooted IGNORANCE fast enough to make it have any impact on Americans starting to make any wiser/more Life affirming Choices? As far as the American "Leaders" today go; They are just as bad (cause the Teen Arrogance always preceds a HARD Fall!... ) as ANY earlier Teen arrogance --or egalomania-suffering RULER has ever been, that is very true,Quinty, but let's HOPE and PRAY these will be the lastQ.... not just here but in the whole World, from now and into Eternity!.... Let's hope that the exposure of this kind of guys' behaviour has NO place on this Planet EVER any longer!This is possible ONLY IF many of the Every-day People wake up to THEIR part of DIGNITY & DECENCY , relating to ALL Life/Living Things with GENUINE Compassion. ONLY this will be a Platform to launch a worthy to participate Tomorrow for each Human on this Planet. As it stands today this article could have been said a million times these past 5- 6 thousand years already! 22 Jul 2008 @ 22:30 by a-d : Ron Paul FOR America (n People) again! What a guy! ( the comments at the end of article are worth reading too. http://www.house.gov/paul/index.shtml then click on the first subject line: " July 21,2008 Faith-Based Currency "
America was once brave in a good way. Brave enough to help each other up. We have become confused about what bravery is, what freedom is, what power is and about what we are collectively I think. That said; what are WE going to do about it? I have something that is in my heart and mind and has been for years. I've grown it like a baby inside me and birthing time is here. I need others to help deliver only because WE is not ME. A few of us will do to start the first Cocoon. This is what I call the model that has grown out of cross refferencing many disciplines. It is balanced and full and able to support and encourage disassociated people who have become almost lost is their own despair. Our country is not geared for helping so many. The "rememdies" we have are unkind, incomplete and circular. The social service system means well but it can not truly help. It has become topheavy, insensitive and unrealistic. It can help some but we can help many many more to help themselves. If you have an interest in a new social design of communal living that is in reality an incubator for personal, social and economic success, let's talk. Let's open a discussion about Cocooning and how it works. Like I've said, I've been working on it for years. It's time to put one into action. I need a house with property in Washington State to begin the first one. I need you to become involved in conversation and mentoring if you have skill sets to offer an intentional village that puts people dynamics first. I have read the above with great interest. You are people who see, who care and who need to do something to help. Let's talk. 3 Mar 2013 @ 13:54 by janosabel : "What are we goind to do about it"
First be aware of powerful opinion makers who justify poverty on the grounds that inequality is a good thing because it "keeps people on their toes". for these comments. Perhaps the whole notion of a "middle class" has been a failure? 15 Sep 2006 @ 09:09: Why Have Liberals Been Afraid?